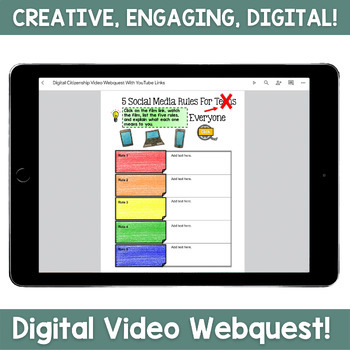 This highly engaging Google Slides video webquest teaches students how to be citizens in a digital world. Students will think twice about posting personal information online after completing this activity. 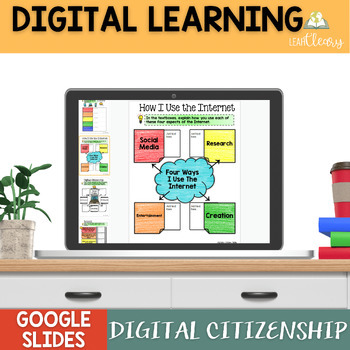 They will be encouraged to consider their responsibilities as digital citizens, which include respect, safety, lawfulness, permanence, and, of course, responsibility. By the end of the webquest, they will be encouraged to think before they post, to question the validity of online sources, and to be kind to one another online. You will get an explanatory PDF with a link to the document. 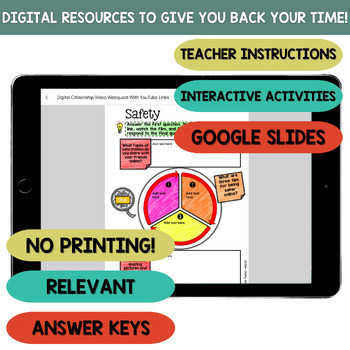 This resource will also help you get out of the copy line! ⭐ Be sure to check out my blog post and FREE sign and note page on this topic. ♻️ Completely paperless--NO COPYING--NO PREP! ♻️ Students work directly onto student pages. ♻️ More engaging for 21st century students. 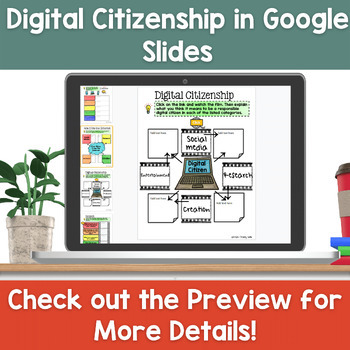 ♻️ Perfect for the 1:1 school or those incorporating technology use in lessons. ♻️ Perfect for organization of all student materials in their own Google Drive--NO MORE LOST NOTEBOOKS! ✍ Materials may be printed. ♻️ Google Drive is free for teachers and students! ♻️ Students can complete assignments anywhere they have access to their Google Drive.